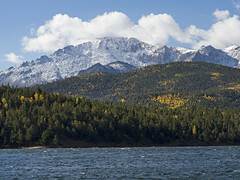 At the confluence of mission, competencies, and culture, Goal Zero recycling advances the sustainability efforts of Care and Share Food Bank for Southern Colorado. Just getting started, Goal Zero is extremely clever in its origin at this confluence. And the alignment is clear. Easily captivated by pithy quotes, I keep a running list (despite questionable attribution). If in print, I’ll keep it as a clipping. Just a day after picking up the Drucker quote above, I picked up The Icarus Deception by Seth Godin at my neighborhood library. For a class I’m taking this semester in the MBA program at the University of Colorado-Colorado Springs, I got to choose and review the online marketing book of my choice. The deliverables included a formal book review, a blog post, a video and an in-class presentation. With my first two choices gone (David Meerman Scott’s The New Rules of Marketing and PR and Hubspot’s Inbound Marketing), I turned to Rework from the guys at 37 signals. Rework turned out to be a little too general business for the purposes of the class, but I did write it up here earlier. Fortunately, a brand new, big idea book was recommended by Seth Godin as I was still in search mode. 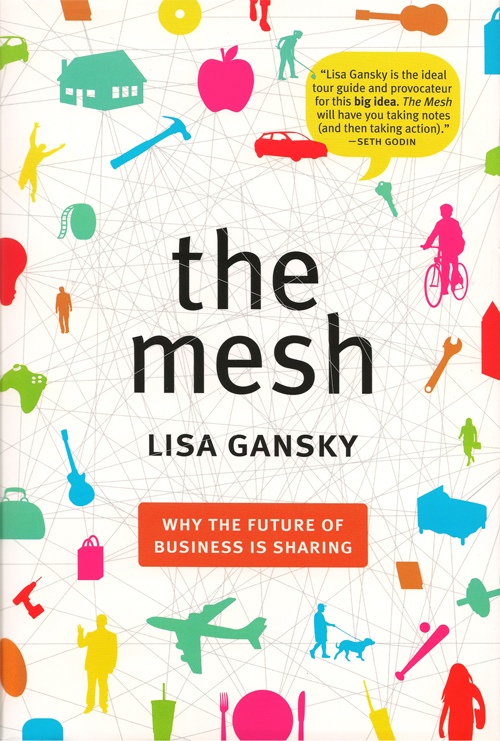 I ordered, read and reviewed The Mesh: Why The Future Of Business Is Sharing by Lisa Gansky. The Mesh was very obviously a labor of love for Gansky, whose personal and professional passions are evident in the book’s concept, premises, tone and style. The describes her vision, illustrates it with examples and backs into the broader driving and enabling trends making Mesh businesses and strategies possible and advantageous right now. It’s this drawing together of otherwise disparate observations that makes her book feel so fresh. I’ve already written a review and collected several links for the class blog post. Here, I thought I’d take a minute to observe how it so nicely connects the themes and sub-heading of this blog – marketing, environment and culture. Marketing The Mesh argues in favor of a business model that both threatens traditional companies and creates opportunities for new ones. A Mesh company or a Mesh strategy employs: a core offering that’s shared (access rather than ownership); web, social and mobile networks; increased customer interactions; increased layers of information and analysis of data; and offers that are more and more timely, relevant, personal and location-based. Think Netflix versus Blockbuster. Both rent DVDs, but Netflix is, at its core, an information company dedicated to making it easier and easier for customers to find, watch and review movies and television shows. Meanwhile, Blockbuster is in bankruptcy protection. 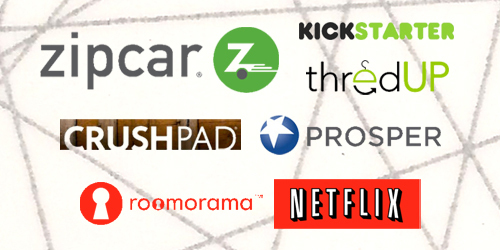 Zipcar was another key example in the book. With your mobile device, you can locate, select, reserve and unlock one of dozens of individually-named Zipcars parked around your city. Each transaction provides data about who, when, where and how long the car is used. Zipcar’s partnered with all kinds of other businesses in complementary ways to provide more – and more personalized – value to each customer. Environment One of the underlying themes behind the share concept is an increasing population and limited resources. The increasing population is also increasingly urban; this density is required for share platforms to scale properly. At the same time, it’s clear that our disposable consumer culture is unsustainable. Mesh companies need highly durable goods from their suppliers. Through frequent and repeat use of shared goods and real-time data collection, Mesh businesses will understand each product’s strengths and weaknesses, like when and how it’s likely to fail. While demanding greater durability from suppliers, they’ll be in a unique position to provide information to aid in that mission. Culture There are many broad, cultural themes in The Mesh. For example, acceptance and adoption of share platforms requires a shift away from ownership toward access and sharing. Gansky also covers customers as communities within the same share platform. So many of the factors that permit the Mesh characteristics and driving and enabling factors to be observed and formally captured in a book are temporal and cultural. All three themes – marketing, environment and culture – are ever-present in this quick and fun read. I recommend it to marketers, entrepreneurs, environmentalists, futurists and anyone broadly interested in what’s happening out there right now. My blog post for class that’s loaded with links can be seen here. Seven of the dozens of examples provided by Lisa Gansky to illustrate her concept of The Mesh.